Has the Company’s performance during the year been in line with your expectations? The industry has seen a lot of positivity over the past few months in both the domestic and the international markets. 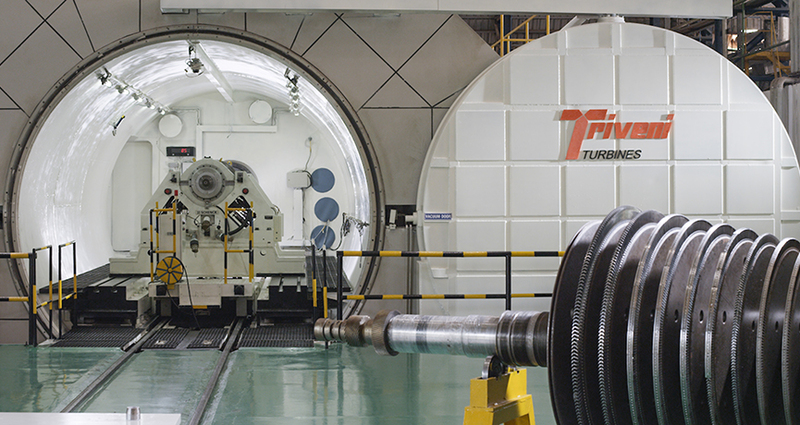 This has naturally translated into improved enquiry generation and order finalisation over the previous year in the domestic steam turbine market for under 30 MW. A lot of these enquiries have come from sectors that are on a high growth trajectory, such as Cement, Steel, Paper & Pulp etc., which have picked up momentum since the demonetisation and GST related issues started stabilising. As far as the international market is concerned, the turmoil of the previous year has given way to a stable macro environment, leading to a major spike in order booking, which has shown a substantial 40% increase over FY 17. This growth has come mainly from South East Asia, parts of Europe, and SAARC etc. Given the overall positive churn in the export market, we have moved more aggressively in enhancing our Aftermarket service proposition in international markets. Our international offices will help in catering to customer needs more effectively across time zones. We see the Aftermarket segment emerging as a key growth driver for the Company in coming years. How would you summarise the operational and financial highlights for the year? Net Income from Operations has been almost flat, at ₹ 7,511 million in FY 18 as against ₹ 7,446 million in FY 17. However, the profit after tax declined at ₹ 960 million in FY 18 as against ₹ 1,236 million in FY 17. The main reason is the product mix that has been executed during the year – with 55% share of domestic sales in the total sales. The decline in exports turnover during the current year was on account of lower export order booking in FY 17. Similarly, in the aftermarket segment, the revenue from refurbishment has been lower than our estimation, which also had an impact on the margins. The year under review recorded a strong order inflow from the export market. The mix of exports in the current year’s order booking has gone up to 51% from 42% in FY 17. The overall consolidated closing order book at ₹ 7.1 billion during FY 18 is higher by 12% as compared to the opening order book as on April 1, 2017. This should help in improved profitability and margins going forward. The Company continues to retain the market leadership with a market share of 64%. Innovation has emerged as a key driver of your growth strategy. What are the steps being taken to strengthen this edge? The Company’s innovation focus has evolved over the years to align our business strategy even more closely with customers’ needs, in order to deliver customised products and solutions that boost efficiencies through the product lifecycle. We are cognizant of the need to propel sustainable growth through low-cost, high-efficiency products and solutions, benchmarked to global standards of excellence. Our differentiated business strategy is mapped to our innovation thrust, which we continued to strengthen during the year with regular product design and quality upgradation, new technological advancements and diversification into cleaner products operating on renewable energy. Adopting new digital technologies, and harnessing the IOT (Internet of Things) strength, TTL is also continually upping its digital ante to reach out more effectively to its customers. With customer at the centre of all our initiatives, we are now providing remote monitoring and diagnostic facilities, as well as better control during the product lifecycle with our updated Product Lifecycle Management software. Upgradation of ERP is also in line with our enhanced technology focus. Overall, innovation is making our business more resilient and able to withstand external pressures. Apart from innovation, what other drivers of growth do you see propelling the Company’s expansion and progress in the coming years? The Company’s growth strategy is impelled by a multitude of synergistic elements, all of which are collaborating to push the momentum of our business development and expansion. A strong process-based management structure assures a high level of quality assurance to ensure total customer satisfaction. At TTL, we believe in, and follow, a partnership approach, which enables stringent adherence to quality through alignment of our partners to our strategic agenda. Our products are benchmarked to global quality norms, with a ‘Zero Defect’ policy and an automated customer complaint resolution system further enhancing our quality compliance. Manufacturing excellence has been built into each of our facilities, thus ensuring the highest levels of quality adherence, as well as commitment to globally benchmarked standards of Environment, Health and Safety. Our core of capabilities, led by a visionary leadership, is another pillar of our differentiated business model. A highly motivational HR framework ensures consistent talent nurturance and retention that keeps our people consistently aligned to the Company’s transformational goals. This has also helped in building and sustaining a culture of continuous innovation and enhancement across the organisation. We have laid strong foundation for future growth and progress over the coming years is clearly visible. Could you give an update on the GE Triveni Limited (GETL) joint venture? The overall performance of GETL for the year under review has been below expectation due to deferment of deliveries by few customers. During FY 18, GETL recorded sales of ₹ 949 million with a Loss After Tax of ₹ 69 million. Owing to sluggish market conditions both in international and domestic markets, the joint venture received only one order during the year for a 35 MW turbine from the international market. However, the orders in hand and enquiry pipeline is encouraging from international market which we believe should help in better order booking in coming quarters. Though the competition in this segment is strong, we are confident about our ability to harness the growth in demand that we see ahead in the global market for turbines in the above 30-100 MW range. The Company’s innovation thrust extends to GETL, which, I feel, will continue to scale up its growth prospects in the near future. What are the Company’s areas of focus as we go into FY 19? The key areas of focus during FY 19 and beyond will remain on our growth strategy that links innovation with growth in market reach across international geographies while supporting it with strong customer-centric aftermarket solutions. We believe that the coming year should be a strong year in terms of the overall performance of the Company owing to the increasing export order booking and aftermarket businesses and a strong carry forward order book and robust enquiry pipeline. The increased focus and market penetration in new geographies have started showing signs of positive results that should strengthen the Company’s growth in the export market going forward. This also helps us in evenly spreading our order booking from various markets, which in turn will support us in mitigating the risks in market volatility to a very great extent. Similarly, the offices we established in different countries are also gaining traction in terms of enquiry generation. In the domestic market, the Company has a good pipeline of enquiries spread across process co-generation, sugar co-generation, IPPs, and metals which is expected to result in order booking going forward. How do you see the long-term future of the Company? We believe investment in new technology, innovation and customer growth through extensive market reach and penetration are the drivers for the long-term business growth. We are aware that in order to achieve this, a dedicated and experienced team is needed. We are proud to have an excellent employee base of highly skilled engineers with a perfect balance of new recruitments and retained employees who have been working with us for over a decade and more. We are focussed not only on the growth opportunities available in the current market scenario but also envisaging the future growth areas and working simultaneously to come up with solutions that can help us in exploiting these opportunities in the future. We are confident of not only maintaining our leadership in the domestic market but also furthering our stronger foothold in the international market in the coming years.